A few people have asked my thoughts on the Toyota Sienna campaign, particularly the idea of positioning a minivan as a “Swagger Wagon.” Well I have to say I love it. It is becoming one of the best campaigns of 2010. 1.) It gives the vehicle a distinct personality. This is rare these days. Most marketing today is about showcasing individual features of the car. Here Toyota is focusing on giving their minivan a unique positioning statement. 2.) It mocks the target consumer in a way that even the audience it is trying to reach finds it fun and unoffensive. Anyone buying a minivan has surrendered to a life of sacrificing style for function. Toyota’s marketing team has built off this surrendering by having some ridiculous fun with the parents by blending the hilarity of rapping middle-age parents, focusing on the lifestyle as if it is something to be desirable, and still maintain the product benefits to the consumer. 3.) The two actors are perfectly cast. Someone shared with me that they come off as “asshats” but I think they embody the sense that parenting has become too serious and really needs to relax. After years of parents over nurturing their kids, the time has come to get back to focusing on the needs of the parents and some relief from child rearing. 4.) Oddly enough it creates a sense of pride in the vehicle. The Sienna is no longer just another minivan it is a “Swagger Wagon” and that identity will stick. Good or bad, it will and those who buy one will find a sense of pride in owning it. Imagine pulling up to the next family holiday party in your Swagger Wagon. Now that’s style over function. 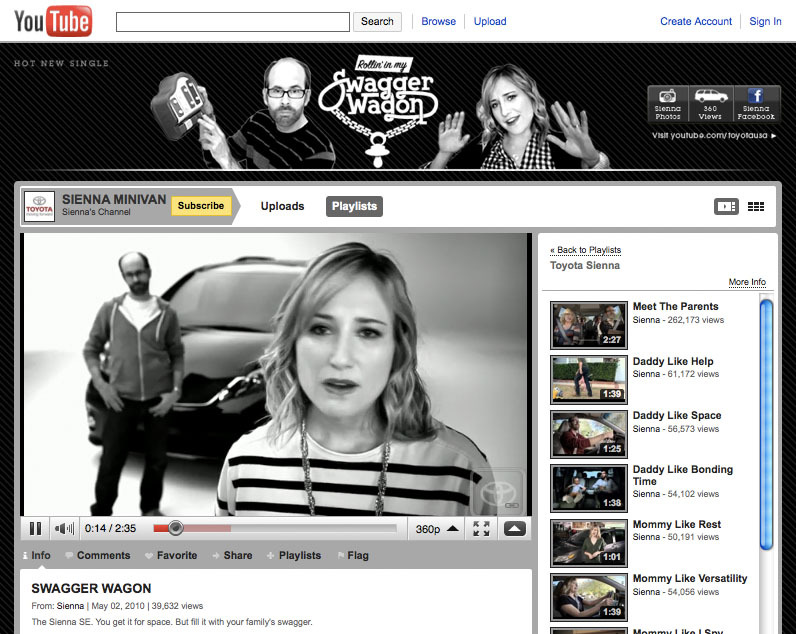 To launch the latest music video for the campaign, Toyota bought a roadblock on YouTube’s home page that featured a banner with an integrated video taking people to the Sienna YouTube channel. I looked at the ad unit early yesterday morning and there were around 40,000 views o the video. Tonight there are 466,748 views! A very impressive feat for a one-day home page ad unit; though, it wasn’t only the ad. Toyota received a lot of buzz coverage from the major and minor automotive blogs and some other media outlets because the video is actually entertaining. The most impressive contribution, I didn’t once think about Toyota’s recall issues while watching it. Long live the Swagger Wagon! I have been a fan of these videos since they came out and I love the latest music video spoof. Toyota was brave to allow the parents to be so narcissistic and self-centered at times. A lesser marketing department would've cut out their flaws and the final product would have been weaker for it. They may be "asshats" but I love these characters because they are funny as hell. I can't wait to see the next installment and I don't even have kids!